I saw something come up in one of the craft blogs I read that I just had to have: an antique printer tray upcycled into an awesome jewelry display. I thought about going onto Etsy to purchase one but inspiration struck and I made the decision to tackle the project with my own two hands. Printer trays were used between 1890-1960 to hold the various pieces of an alphabet set. Let me share a fun fact I learned during my internet research: these trays were organized in font families and stored in vertical racks- which is where the terms "upper case" and "lower case" came from. You can thank me when this question comes up at your local bar's trivia night. I devoted an entire evening to just sanding the tray. I had to use a coarse sandpaper on some of the rough spots, and even busted out the Dremel with a sanding drill bit to get the worst spots, like on the top where there was still a coat of gray paint. Then, I went over the whole tray with a very fine sandpaper. That was only three sentences to describe this step but trust me when I tell you that this was A LOT of work- but definitely worth the elbow grease. Knowing that the front side would be difficult with all its nooks and crannies, I chose to ease myself into the task and spent the next two days working on the backside of my printer drawer. It was a two (or three) step process: wood treatment (I chose Minwax Pre-Stain Wood Conditioner) and two coats of a one-step stain & finish, Minwax PolyShades in Antique Walnut. This part was the only step of the whole process that I could say was a piece of cake. It was finally time for the front. The process was the same as the back with the wood treatment followed by stain & finish, but took about a million times longer to complete. I had to go back and sand off some of the first coat that dripped off the sides and dried a little funny before going back in with the second coat. The picture below is after the second coat- I later decided to give just the edges a third coat to give it an even richer color. It was finally time to add the hooks! I used eye screws in size #216. It took a quality brainstorming session to figure out how to actually attach them, but once I got there it was smooth sailing. I used my Dremel Minimite to make little holes, being careful not to go all the way through the divider, then was able to screw them right in. 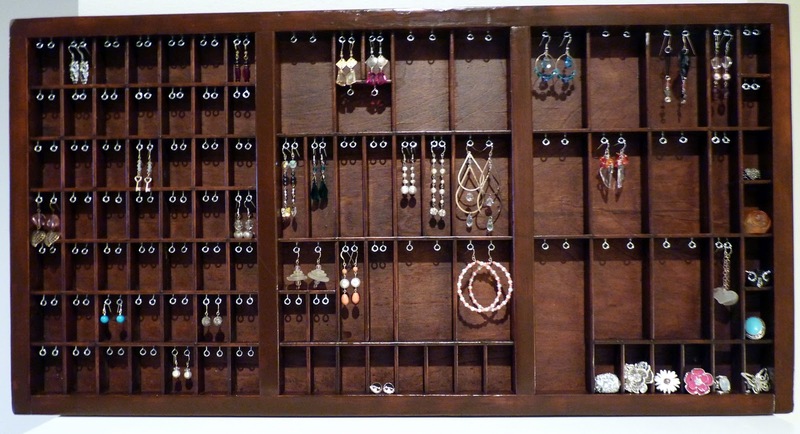 I chose to leave a few compartments without screws to use for post earrings and rings. This was definitely time consuming but a great job for multitasking during the Golden Globes. Go Glee! And another link from Completely Coastal, scroll down to the fourth photo: they turned an antique printer tray into a coffee table! I LOVE this. I want to leave you all with this- tonight's episode of Pawn Stars on The History Channel featured a gentleman who brought in his prized collection of rare fishing lures. What were they displayed in? You got it- an antique printer tray.